The internet is awash with forex trading advice, currency trading strategies and financial gurus promising incredible returns if you simply follow their strategic trading plans. From training videos on YouTube to financial investment blogs, The Wall Street Journal and TV infomercials – everyone is eager to impress the everyday trader. Routine promises of big returns are readily bandied about, on the proviso that you jump right in and start trading forex right away. However, to quote Shakespeare “They stumble that run fast” – one should never be too quick to start trading forex online without a thorough understanding of currency exchange terminology, jargon and market analysis-related realities. The currency trading world is a hive of activity, and there is incredible earning potential out there. Before you immerse yourself in real money trading, we would like to introduce you to the most important concepts, such as lots, pips, spreads, margin, and leverage. Foreign exchange (in short: forex) is the world’s most actively traded market, eclipsing the New York Stock Exchange, London Stock Exchange, Hang Seng and all other indices combined. With such volume, your objective as a forex trader is long-term equity growth. A Lot is a quantity of foreign exchange units (typically currency pairs) that you wish to buy or sell. It is designated as Lot Size or as Volume. There are in essence three types of Lots: a Standard Lot, a Mini Lot and a Micro Lot. 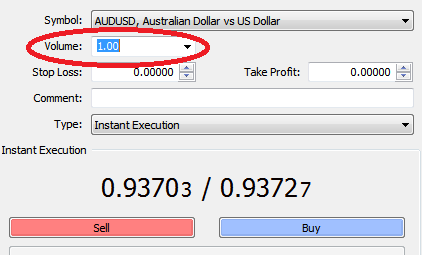 In the AUDUSD currency pair, for example, if you buy 1 Lot, you are investing in AUD $100,000 (the Australian Dollar being the base currency in the pair). The manner in which Lots are identified will vary from broker to broker and across trading platforms. It is imperative that you do your homework before trading Lots. Most investment gurus suggest that novices practice trading forex with a demo account prior to depositing and trading with real money. This will help you to better understand how Lot requirements function in a live market. When you examine the exchange rate between two currency pairs, a Pip represents the standard unit to measure changes in prices. To put it into perspective, a Pip is typically one hundredth of 1% of the value or, in decimal terms, 0.0001. In the world of forex trading, this is otherwise known as a Basis Point. The above definition of a Pip holds true for all currency pairs quoted to 4 decimal places; in the case of the Japanese yen (¥), however, the 0.01% rule is replaced by the 1% rule, since the Japanese yen (¥) is quoted to 2 decimal points. Take a look at the images below for further clarification about Pips as they pertain to currency pairs. Note in particular the 4 decimal points in the AUDUSD currency pair, and the 2 decimal points in the USDJPY currency pair. 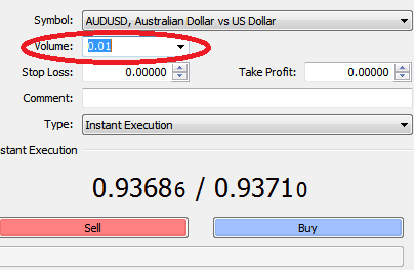 As an example, consider a 1 Pip gain in AUDUSD from 0.9467 up to 0.9468 – a 1-Pip gain. By contrast if we look at the USDJPY currency pair moving from 100.92 to 99.92, it reflects a loss of 100 Pips. When dealing with currency pairs or stocks, the Spread represents the difference between the bid price of an asset and the ask price. Brokerages sell currency pairs to traders at a higher price and buy at a lower price. A combination of factors determines the Spread of a currency pair, including the cost structure of the broker, and market supply & demand forces. It is easy to determine what the Spread is with a currency pair, since the quote displays it for you. Consider the case of the AUDUSD currency pair, which is quoted as: 0.9423/0.9427. It is clear that the Sell price (Bid) is 0.9423, and the Buy price (Ask) is 0.9427. The Spread can easily be calculated as 0.0004, or 4 Pips. The reason why the Spread is so important is that it reflects the smallest number of Pips that the market must move (in the desired direction) in order for you to break-even on any particular trade. The amount of money available in your account, with no open positions, is your balance. Equity represents all the funds in your currency trading account + Gains/Losses you have in your open positions. If your account balance is presently sitting at $5,000 and you recently opened a trade that has increased by $1,500, your Equity would be $6,500. In the financial world, Equity represents ownership in assets, such as stocks, real estate and other holdings. Margin is considered collateral or security for opening a trade with a broker. Positions are opened using borrowed money via the leverage provided by a broker/market-maker. Margin trading enables investors with smaller amounts of capital to take leveraged positions in the market with greater scale than otherwise available. Calculating margin is done by taking the market value of an instrument and dividing by the amount of leverage. For example, in the case of EURUSD, if we were to purchase 1 lot (100,000 units of Euros) with a leverage of 200:1, we would divide 100,000 by 200 which gives us EUR 500. This amount is the necessary margin that must be allocated to keep the trade open. For currencies, it is important to note the base currency to determine how to calculate margin in the deposit currency. For instance, if buying 1 lot of EURUSD (100,000 units), the calculation would be 100,000 multiplied first by the exchange rate, and then divided by the leverage. Margin level is an important concept, because maintaining a certain amount of margin is essential to keeping positions open. Expressed as a percentage, if margin level falls below a certain threshold, the broker can close the client out of opening new positions; if it falls further, the customer receives a margin call, and the broker begins to close down positions. Margin level is calculated by dividing equity by the current amount of margin in use. Both of these values fluctuate with market conditions, so most platforms that employ margin trading automatically calculate the value (and changes) in real-time. Once you start trading, you will notice that Margin and Leverage work alongside one another. There is a unique relationship between the two: the lower the Margin, the higher the Leverage, and vice-versa. It is especially important to use due diligence when considering the level of leverage that you wish to take on. Remember that currency trading has the capacity for high degrees of volatility, and high leverage can increase your overall risk. With leverage, you can gain access to high-value trades with very low initial investment. This has the effect of magnifying your profits, but also the potential of increasing your losses. Recall that Leverage and Margin work together. The reason why we have Leverage is to allow you to enter positions much greater than the trading funds you have available in your account. Let us say that the Leverage Ratio is 50:1. This means that the associated Margin is 2% (1/50 = 2%). If your trading account had $5,000 Margin available, you would be able to trade up to $250,000. Leverage ‘magnifies’ what you can trade with and this allows you to take out much bigger positions when trading foreign exchange. What is a Forex Trading Bonus? Occasionally, your broker will offer you a bonus which you can claim, provided you abide by the Terms and Conditions of the bonus offer. An example of a bonus requirement includes placing a minimum number of trades within the first 30 days of receiving the bonus. Other promotional offers include trading competitions, friend referral bonuses, multi-deposit bonuses, and so forth. It is important to read the fine print of the bonus offers at all times to understand the conditions under which you will be able to redeem your bonus. If you wish to determine how much equity you have in hand before you decide to withdraw your funds, there are several principles you need to keep in mind. Let us say you have a remaining balance in your trading account. Take a moment to look at that balance and also look for open trades, cumulative profits and losses on open positions, commissions, and both negative and positive swaps. The amount you can withdraw must take all these factors into account. We do not recommend you withdraw all available funds, because sudden changes in financial markets can take you by surprise, and it is best to have some liquidity on hand. Ready to practice trading? Open a risk free Demo trading account.